This section has tips about your own restoration and maintenance work on the walls of the building. There are principles to adhere to, and specific tips covering work on the pointing and lime, damp and exterior wall paint. This is a 'how to' section. To help you decide what your house should - or could - look like, see the various Design sections. 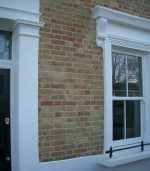 Read about the materials and design history of exterior walls in period houses.